It's time to register for the course, which starts on January 22, 2018. Email Renee Hobbs (hobbs@uri.edu) to learn more. This course introduces major theories of digital authorship as a pedagogical approach to digital literacy and includes a range of hands-on dynamic learning experiences that integrate digital media, technologies, and best practice strategies for teaching composition and authorship in a Web 2.0 world. A syllabus from Spring 2015 is available here. Our course hashtag is #EDC543. Information about how to register online is available at the course website: hhttps://digitalauthorship.org/how-to-register/. NOW ENROLLING FOR SPRING 2018. Tuition for the course is $1965. To register for the course, email Renee Hobbs (hobbs@uri.edu) and let her know you would like to register for EDC 534. If you are planning on using a tuition waiver to pay for the course, contact Christine Dolan (christine@uri.edu). Context and Background. This course is designed as part of the Graduate Certificate in Digital Literacy, a four-course sequence. WHY TAKE THIS COURSE? 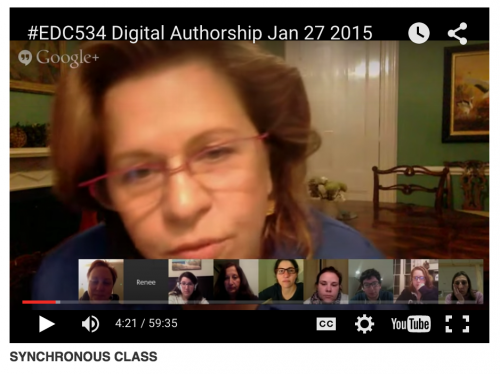 In this course, we examine the practice of authoring multimedia texts as a form of learning. Today, even very young children discover the power of digital authorship by developing their creative expression skills and reaching audiences with their drawings, stories and songs. Children make videos as a form of informal play, at home, in the neighborhood and on the playground. And teens and young adults may discover that their personal, social and emerging professional identity depends on how they represent their own lives through practices of curation and creation. To be literate today, one needs to be both a skilled reader and a competent writer, able to use a variety of technology tools (the Internet, word processing, graphic design software, digital camera, editing) in different social contexts (including for work, leisure and citizenship activities). You need the ability to access, analyze and compose messages using symbol systems (language, image, music, sound) across different modes (informational, narrative and persuasive) and genres (music videos, flyers, gifs, email, web pages, etc). And because literacy is a form of social action, it involves actively navigating a set of power relationships as a member of a discourse community (as a family member, a music fan, part of a team, etc). In this course, we’ll examine multimedia authorship through a variety of disciplinary and professional perspectives, including media literacy, media arts, youth media, writing and rhetoric, media studies and education. As an expanded conceptualization of literacy, digital literacy depends on re-imagining the role of a host of related concepts: texts, voice, agency, expression, representation, process and product, and the role of the creative artist in a Web 2.0 world. But even as the variety of free or inexpensive digital tools continue to proliferate, nothing about the process of creating digital media is easy – like all creative processes, the practice of authorship requires intellectual curiosity, courage, confidence, tenacity and openness to risk-taking and experimentation. And although scholars may proclaim the empowerment that results from creative expression, there are also some risks and challenges involved in digital authorship. In this class, we explore the practice of digital authorship by considering creative work as an essential part of the inquiry process.